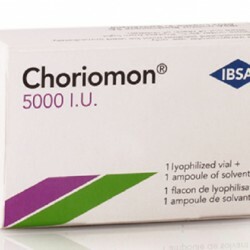 Choriomon 5000 I.U. 1 vialManufacturing Company: IBSAActive Substance: Human Chorionic Gonadotrophin (HCG) Each pack contains: 1 lyophilized Vial of HCG + 1 Ampoule of solvent Pharmacological effect: Choriomon is an injectable medicine. It is produced from Gonadotropin. This substance is acquired..